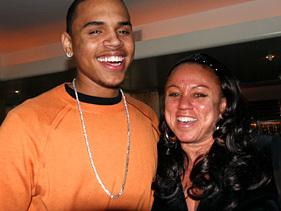 *Chris Brown’s mother is hoping the singer eventually opens up about the events that led to his beating of Rihanna so he can “learn to deal with it” and move past his anger problems. The singer sat down for an interview with CNN Larry King months after the incident, but has refused to discuss the matter ever since – even losing his temper and smashing a window at the “Good Morning America” studios in March after host Robin Roberts tried to discuss the subject. But Brown’s mom Joyce Hawkins – herself a victim of domestic violence – wishes her son would discuss his feelings about the attack because his troubles will continue to haunt him until he learns how to let go. “I think he really needs to talk about the situation in itself, what actually happened to Rihanna… so that he can get that out for himself,” she tells Sister 2 Sister magazine. Brown completed a court-ordered anger management course last year as part of his sentence. He was also placed on five years probation and handed six months of community service. She should of made this statement 2 yeras ago. She side stepped what happened and made excuses for her son. She is changing her tune now that everything is over and done with. Why is this news worthy now? Well put, she laid the situation right at his feet. I only hope he takes her advice. I question why she speaks on it in the media at all. She’s brought the event back to the limelight. I say give him the exact same advice but in private. Otherwise, no comment. Oh wait…nobody in the media would talk to her otherwise. No actually?…YOU have to “own it”, at least “half” of it! YOU exposed your son to this sort of behavior, allowing someone to do “this” to…you! So….stop helping YT UNjustly condem your sonnnnn! And…WTH are you “just now/STILL talkin about this!?? SMMFH!